Facilitating meetings and workshops is about planning, guiding and managing a group event so objectives are met through real participation – which leads to tangible buy-in. As management styles evolve, and collaborative teams become the norm, facilitation skills are increasingly important for managers and specialists. This hands-on seminar is for managers and specialists who currently, or expect to, facilitate meetings, workshops and conferences. 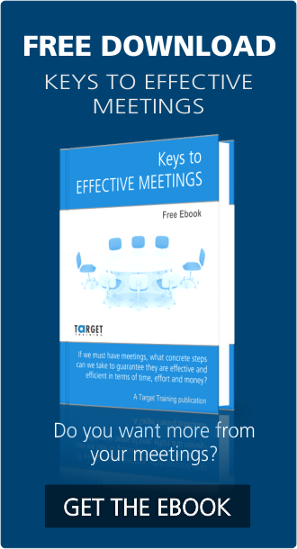 Typical participants are looking to acquire new and proven tools to deliver outcome-oriented meetings and boost their confidence when facing the unexpected. developed your understanding and appreciation of the role of the facilitator and the tangible benefits that effective facilitation brings. developed a checklist for effectively preparing to facilitate. practiced a wide range of facilitation methods. developed and implemented a process for facilitating. prepared to manage the unexpected. set the scene for transferring your newly acquired facilitation skills back to your workplace. Facilitating – what does it really mean? Valuing the benefits of effective facilitating. Identifying key values, attitudes, skills and behaviors needed by an effective facilitator. Setting the scene for successful facilitation. Selecting and implementing appropriate facilitation methods. Validating, valuing and giving feedback. Managing difficult people in difficult situations. Transferring training into the work place.